A Memorial for Mike Taylor took place today at Haughley Park Barns, near Stowmarket. This moving tribute to Mike was attended by more than 150 people, and included six Suffolk chess-players (Michael Clapham, Mike Cook, John Feavyour, Steve Gregory, Bob Jones and Laurie Pott). 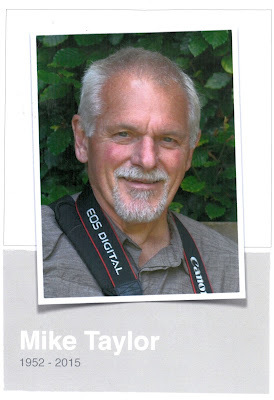 There were several 'chess' references in the family's memories of Mike, but it was clear that he had many other interests, including music, photography, cycling, food and wine. It seems he was almost unbeatable at Scrabble and enjoyed a challenging Sudoku puzzle. Mike had recently started to teach chess to his 6-year old grandson, Alfie, who lives in Bury. So we may well be seeing him soon at the Bury Knights! Hi Bob, I'm sorry that I couldn't make it to Mike's memorial earlier today; thank you and the other guys for representing all us local chess players. Mike was such a nice guy and I enjoyed our games against each other, I also sat next to him at various county matches over the years and he was always very friendly and I enjoyed chatting with him after our games had finished. He'll be greatly missed.